These are full blood documented, registered and have documented Pedigree lineage. They will be registered as Miniature Pinschers and a pedigree comes on every one of their registration certificates. They will leave our care current on shots, wormed and with their HPA puppy papers for registration. Every one of our parents have DNA on file with HPA. All sires have been MPS VI tested which guarantees you that no puppy you purchase from us will be affected with MPS VI. Our females have just been tested as well to be sure that none of our puppies will be carriers as well. We give a lifetime Replacement Guarantee on our puppies as well. Whether you buy from us or somebody else be sure that they have tested their dogs for MPS VI and will stand behind their puppies genetic health. Our gorgeous male Miniature Pinscher is on site. His puppies will be of “Champion” Bloodline and Champion Sired. 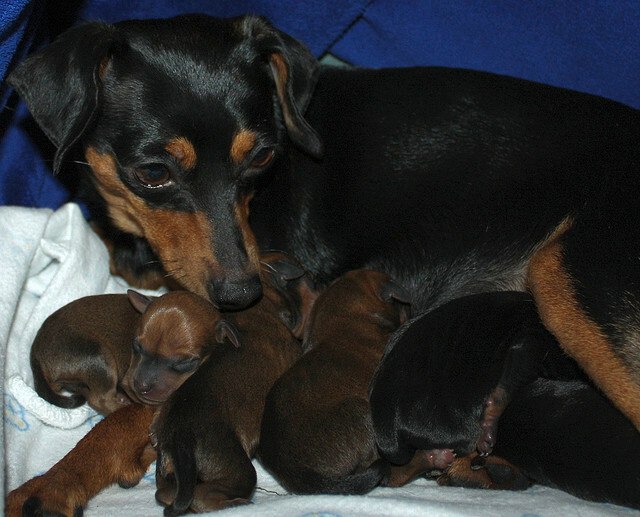 Sire is the 1st registered Miniature Pinscher so is the founding sire for the HPA bloodlines. Sire is small, typey and drop dead gorgeous and the females we’re breeding him to are very nice as well. …. AND if your interested in Miniature Pinschers then do not hesitate to email us as we have the best in town.